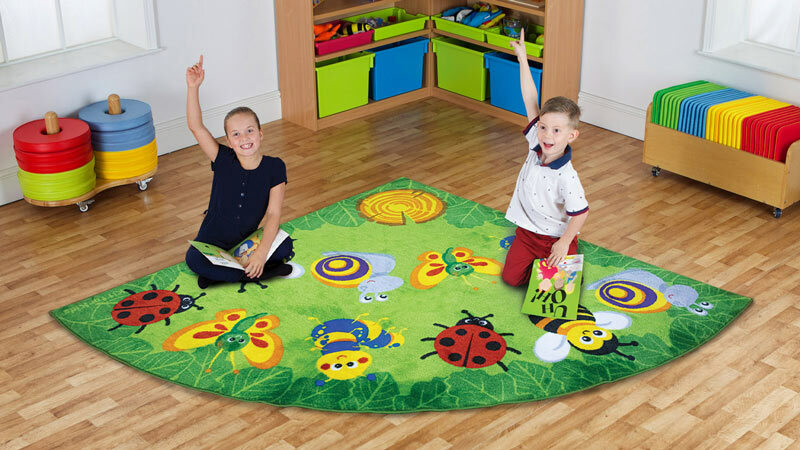  Medium sized 2x2m rug with clearly identifiable bug creature placement seating areas for a Primary group size of up to 8 pupils plus a teacher area.  Brightly coloured, concentric row seating in an amphitheatre design, ideal for group teaching activities.  Ideal for reading and group activities with clearly defined teacher and child placement areas.  Distinctive and brightly coloured, child friendly designs.  Designed to encourage learning through interaction and play.  Tightly bound edges to prevent fraying.  Recommended for classrooms and soft reading/play areas.  Heavy Duty Tuf-Pile - Substantial carpet, soft textured tufted pile for comfort and long lasting.  Crease resistant with unique Rhombus anti-skid Dura-Latex safety backing.  Abrasion resistant, laboratory rub tested to heavy duty standards.  Nylon twist soft textured finish.  Meets all relevant safety standards.  Please allow 3-4 weeks for delivery.  Free deliver on everything.